You need peace of mind when it comes to security threats. 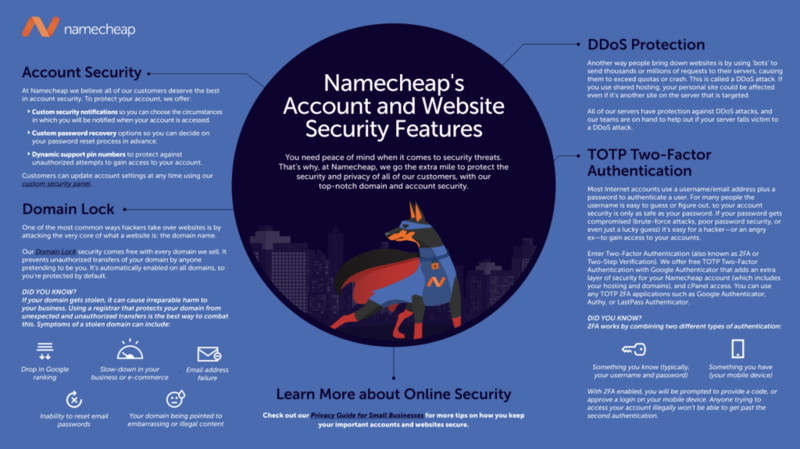 That’s why, at Namecheap, we go the extra mile to protect the security and privacy of all of our customers, with our comprehensive account and website security. You can activate all the features below to keep your data and website safe. Our security features include two-factor authentication, DDoS protection, Domain Lock security and free WhoisGuard for life—all of which are free with every account. We also offer optional features like Premium DNS. To make you aware of the extensive features your Namecheap account has to offer, we’ve put together a helpful at-a-glance guide detailing what each of our services is for, and how best to utilize them. Think it would be useful to your friends too? Share the link and share the love—we want everyone to know what their Namecheap account can do for them! Our Knowledgebase is packed with instructions detailing how to set up all of our security features that aren’t automatically enabled by default. You can also access a whole host of articles with tips and advice on security at our blog. As always, if you need any further information or guidance, our customer support team is on hand to help you with anything you need 24/7. The web can be a dangerous place. Identity thieves and other threats are lurking everywhere. You need to look out for both yourself and your customers. Namecheap is here to help. It is necessary to improve the notification about the security status of the domain lock, since in one case it occurred to me that a domain was in an unlocked state, I did not know anything about it until another tool from another provider notified me about this situation. Before in the list of domains you could see the status of the domain lock, now it is no longer possible. Thanks for reaching out. We used to show the domain lock status on our old domains interface, but that was changed several years ago. If you need further assistance with this, please feel free to reach out to our customer support team. Any chance you folks will be supporting U2F in the future? My company policy mandates we can only use services which have U2F. It would be great if you could support hardware tokens like Yubikey. We have just announced U2F authentication so now you will be able to use Yubikey.